bought a convex curve cutter at Tampa woodworking show in January of this year. Having a problem in using this piece of equipment. any one have one that can help please help!!!!! I saw one of these at a show a little while back. The concept is solid but the jigs design is in dire need of work. Waaay to much room for error. Wouldn’t a convex curve cutter also be called a circle cutter? Wouldn t a convex curve cutter also be called a circle cutter? Yes, that device looks pretty much like a circle-cutting jig with some additional work-holding devices. I don’t have one, as a matter of fact, just got a sales flyer on it, and was Googling for more info. Know this the guy doing the show, or making the video is going to gloss over info to make this look like it can sing and dance. But if you set this up as they suggest, and use a box of prescribed sizes, the one on the video has very thick sides, they look like they are at least 6/4 material, what will be most important here is all 4 sides must be identical thicknesses, and laid out precisely so you know the same exact distances on all 4 sides. Now the part they gloss over is that all must be real close to exact, the layout part. Failure to do so will get you slices coming off that vary in size. Those will not match up to be the concave box you want. So it is very careful layout. Followed by very careful start of each and every cut to be right on your planned out cut line, and your cut radius MUST fit between lines you have drawn out. Next is clamping it all still so the act of cutting does NOT allow any movement whatsoever. It has already been mentioned the heft of this design is for really inexpensive plastic mold injected parts, that can, and will flex if pressure is put on them. So I agree, it really isn’t very robust. I’ve decided to use curve templates to be printed to Velum, or plastic. There are many templates to use out there. The template looked like the strongest piece of that jig. It can’t be ruled out your problem is caused by the cheesy nature of that jig. But I honestly feel if you have tried several times, that careful layout is not being done on your part, because if it didn’t move, that is the only explanation for why your sides differ. 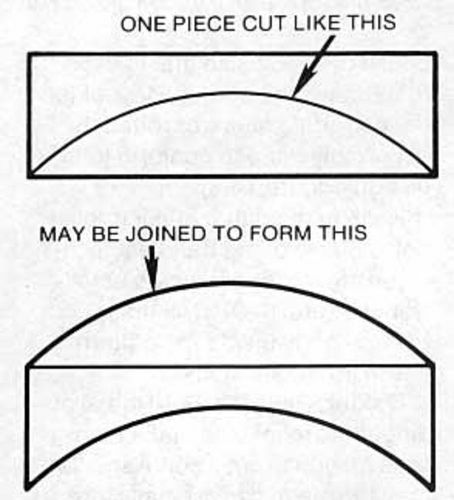 If in fact they were the same exactly, this says you could miter the offcuts to make the inverse box. BTW this is from a book written in the 50’s. But that concept is from early in time. Because Peachtree just sent a mailer on this jig. I posted this so anyone else looking for “other info” might see this thread, and know, as I just figured out, using the templates in my link, and a circle cutting jig, with a sturdy clamping system will save you a lot of cash, and get you a better product.